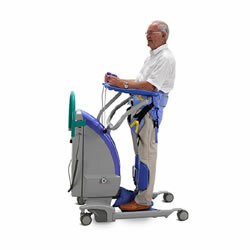 Sara Plus Walking sling gives safe support to patients during standing, stepping and walking practice. ArjoHuntleigh Sara Plus Transfer Walking sling is suitable when Sara Plus is used for standing, stepping and walking practice rather than the traditional use of a standing and raising aid. It can also be used for patients who are assessed as needing extra support for transfers, but it's not suitable for toileting. It comes in four different sizes S-XL with a Safe Working Load of 190 kg/418 lbs.